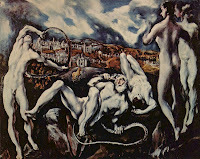 Maite's Art History: Spanish painting of the Renaissance: El Greco. This artist’s wor k is easy to identify due to the deformation of his characters. This characteristic is controversial and while some people attribute it to his astigmatism, others consider that it is only due to his faith. 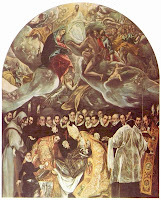 This last theory is based on several points: to make longer images was a resource used in the Gothic; it is a way of underlining the remote and divine; all the masters from whom El Greco received influences used it (Byzantine school, Venetian school and Italian mannerists). 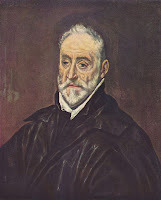 The theory of the astigmatism looks to be a bit weaker because El Greco does not use this deformation always. He prefers to restrict it to some images. For example, in the Burial of the Count of Orgaz terrene characters are normal while divine are deformed. Being the explanations one or the other, it is true that this deformation was more marked as long as the artist was getting older. Apart from the deformations El Greco’s work is know because of his colour. Formed in contact with the Venetian school, he introduced vivid colours in his palette. A majority of the times these brilliant images are reserved for just a part of the painting, while the rest is darker. This underlines the dramatic polychrome effect. A good part of his work is constituted by his religious paintings, but he also realised several portraits, in which he managed to capsize the psychological characteristics of his models. These images are always represented in a neutral and dark background, as if they emerged from the darkness. He also realised some mythological images, such as Laocoon. Other important work is his View of Toledo, a very personal interpretation of the city in which he spent a majority of his life in Spain.